FlickrCash is a Flickr Photo Search engine on steroids with some really unique and useful capabilities. 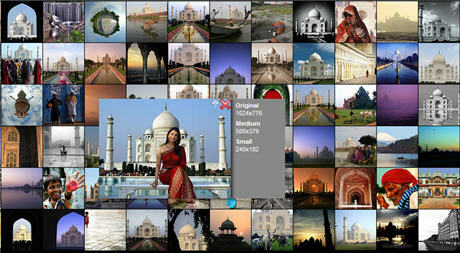 You can use it to quickly find flickr photographs on any topic or even sell your own creative work. You type in a search term(s) and FlickrCash will show square thumbnail pictures of all the matching images on Flickr in a mosaic tiled interface. The number of search results displayed on one page depend on the size of your browser window - the larger the browser window, the more images you will see in one go. If you don't like an image, hit the cross button and it disappears immediately from the search results. As you hover your mouse over the Flickr images, you can read the associated tags and descriptions. And if you plan to download an image from the search results, FlickrCash will show direct links to all the available sizes of that image. Unfortunately, you have to be logged in else FlickrCash adds a watermark to the larger version of the image. Image searches can also be restricted based on the date when the picture was taken or the Creative Commons License associated with the images. Very cool. If you own a Flickr account, you can use the Flickr cash service to sell your images. Just tag the images you want to sell with "photoforsale:price=auto" or "photoforsale:price= 24.95" (or whatever price you want to charge).